For me, collecting the Washington Franklins has been a journey most of my collecting life, as it has been with many members of the committee. We currently have 13 members from intermediate to advanced and between all of us there’s probably several hundred years of experience studding and collecting them. 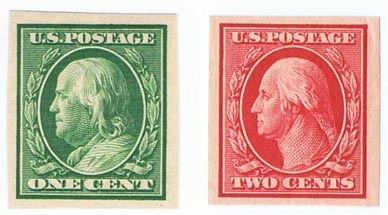 This ranges from all the stamps issued during this period and their postal history, to specialized areas such as coils, rates, private vending perforations, destinations, and treaty rates, censuses of usage of the scarce values, and proofs and essays. You can also throw in cancels, auxiliary markings and whatever else someone can think of that occurred during this time. Members have access to all of us to ask questions, discuss a new find and what may be unusual about it, or even just comments. We also field questions that come from non members and they are encouraged to join in if they wish. We publish articles in The Specialist after being reviewed by all members. Several recent articles that appeared were on the ever popular 5c red error, how it occurred, was found and what ultimately happened to them. A census was also published of their usage on cover, updating one that had been done 20 years ago. Other articles included stories about the “blue papers” and the scarcity of some issues. Even though the series is now over 100 years old and counting, there are still new discoveries being made, new things to discuss, and old subjects to re- live. Combining everything I think that’s why we love the Washington Franklins so much.